HDTV Supplys WolfPackLite™ 4K/30 20x28 HDMI Matrix Switch w/28-HDBaseT CAT5 Extenders switches both audio and video signals. Because it is a matrix switcher, it allows any input to be routed to any output; or the same input to be routed to all outputs, or any combination. 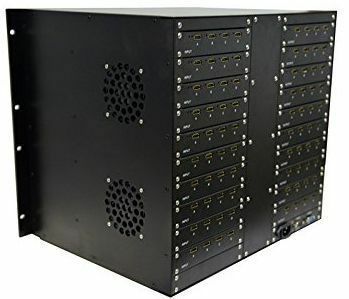 This WolfPackLite™ 20x28 HDMI Matrix Switch with separate and bundled 28-HDBaseT CAT5 Extenders is designed to allow the switching and distribution 32 HDMI inputs to 32 HDMI outputs. The WolfPackLite™ 4K/30 20x28 HDMI Matrix Switch w/28-4K/30 HDBaseT CAT5 Extenders is a top of the line digital matrix switcher made for the demands of todays HDMI (High-Definition Multimedia Interface) routing. Created to route your systems HDMI signals to go to 28 outputs from 20 inputs the 20x28 HDMI Matrix Switch w/28-HDBaseT CAT5 Extenders delivers high performance. The Card Cage chassis has 8 - HDMI input slots and 8 - HDMI output slots. The HDMI input and HDMI output cards are 4 - port HDMI cards having 4 - HDMI connectors on each card. If one populates the complete chassis it configures to a 20x28 HDMI Switcher. Shown below is the configuration for this 20x28 HDMI Matrix Switch w/32-separate (TX & RX) HDBaseT CAT5 Extenders. HDTV Supplys WolfPack 4K/30 HDMI HDBaseT Extenders that come with this matrix is based upon the HDBaseT protocol and can transmit an uncompressed HDMI video and audio signal via a single CAT5e/6/7 cable to a maximum distance of 70 meters or 220 feet away from the source depending upon the resolution. The video and audio is not compressed, there is no latency and the audio and video will always be in synch. 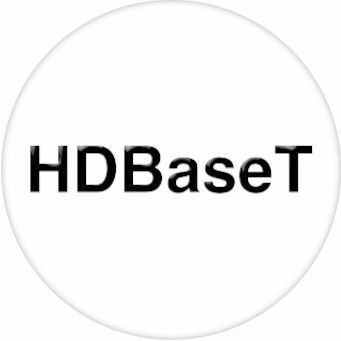 The HDMI HDBaseT Extenders have the Power Over Ethernet (POE) design requiring only 1-AC adapter on either the Transmitter or Receiver. The WolfPackLite™ 20x28 HDMI Matrix Switch w/28-HDBaseT CAT5 Extenders provides full HDCP internal management for todays integration in commercial A/V market, ensuring HDCP key authentication and administering the handshake internally. Our WolfPackLite 20x28 HDMI Matrix Switch w/28-HDBaseT CAT5 Extenders comes with a full HDCP (High-bandwidth Digital Content Protection) internal management system that will eradicate any interception of your digital data. Streaming between the source and display units is easily controlled through our HDMI 20x28 Matrix interface. HDCP key authentication will no longer be an issue when using our switcher. Control for our unit is varied and easily accessible. Enabled RS-232 commands is provided for advanced user control management. Why not buy this WolfPackLite 4K/30 20x28 HDMI Matrix Switch w/28-HDBaseT CAT5 Extenders today? Why not buy this WolfPackLite 20x28 HDMI Matrix Switch w/28-HDBaseT CAT5 Extenders today? Why not buy this WolfPackLite 4K/30 20x28 HDMI Matrix Switch w/20-HDBaseT CAT5 Extenders today? HDTV Supply is a leader in supplying 3D equipment for the 3DTV market. Our test lab includes the latest equipment for designing, testing and supporting 3D video equipment. The chips sets we use support many of our 4K, HDMI 1.3 and HDMI 1.4 compliant devices. The 3D viewing results were awesome in our lab and did not have any picture or audio degradation. The normal and standard (2D) results equally exhibited a superb picture quality. Q: If I need to add a new 4-port HDMI card in the future, where can I find them to order? A: See WolfPackLite 4-Port HDMI Input & Output Cards for WolfPackLite Matrices. Q: Does the matrix support Remote IR (IR Pass-through) from far away rooms? A: No, but it is operated with an included remote control. A: No, we only have 4K/30 HDMI input and 4K/30 HDMI output cards. See the above optional standalone POE 4K/30 HDBaseT extenders which have a Transmitter and a Receiver and one AC adapter. If you need that kind of a matrix see our WolfPack Modular HDMI Matrix Routers w/iPad & Android App. Why not buy one of HDTV Supplys WolfPack™ products today? This WolfPackLite HDMI Matrix Switch is part of HDTV Supplys WolfPack International OEM (Original Equipment Manufacturer) program that allows buyers who buy 5 or more matrices at once to get a discount larger then we already give. If you are interested, send us an email at support @ hdtvsupply . com on your company, the area you support and your experience. Based upon a successful review, we will send you the additional discounts you can get by taking 5 or more of this product a once.